Abram builds an altar in the plain of Moreh and worships God. HE PEOPLE WHO moved away from Babel into different parts of the world did not pray to God. Their hearts were sinful, and they shrank away from the purity of God, as Adam and Eve did when they tried to hide from God's presence in the Garden of Eden. But we find that the people prayed to something. In every country where they went they had some kind of worship. Many of them worshiped things that God had made, such as the sun, the moon, and the stars. Afterward they also worshiped rivers and mountains and hills. They made images of wood and of stone to these things which they worshiped, and called the images gods. Not far from the city of Babel, where the tower was left unfinished, another city was built. This city was called Ur of the Chaldees, because it was built in the home country of the Chaldean people. These people worshiped the moon-god, Ur, and when they built their great city they named it in honor of their god. On the plains near Ur lived an old man who was a shepherd. He tilled the soil and also raised large flocks of sheep and herds of cattle. His name was Terah. He had three grown sons named Abram, Nahor, and Haran. They were also shepherd-farmers. Haran did not live to be very old. When he died he left a son named Lot. Now, Abram the son of Terah was a good man. He did not worship the moon-god as did his neighbors. He believed in the true God. 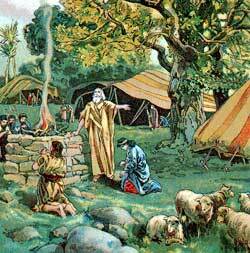 He built altars and worshiped God just as Abel and Noah had done long years before. His offerings pleased God, and his prayers were heard. One day Abraham heard the voice of God calling to him. He listened. God told him to gather together his family and his flocks and herds, bid farewell to his neighbors and friends, and start out on a long journey. God promised to lead him to a land far away, where he would bless him and make his name great. Through his family God promised to give a blessing to all families in the world. Perhaps Abram did not understand the meaning of all God's promise. He did not know that in the years to come a Savior should be born among the people of his own family, who would then be called the Jews. This Savior, we know, is the blessing which God promised to give to all families in the world, if Abram would obey his voice. Although Abram did not know these things, nor even the country to which God wished to lead him, he was not afraid to go. So he took all his family-his wife, whose name was Sarai, his aged father, Terah, his brother Nahor and his wife, and the young son of his dead brother Haran. They and their servants Abram urged to start out with him on his journey. And they took all their possessions too-the tents in which they lived, and the large flocks of sheep and herds of cattle. Day after day they journeyed up the great River Euphrates until they came to a place called Haran. Here they stopped to rest, and here Abram's aged father died and was buried. Even before that God spoke to Abram and urged him to continue his journey. But Nahor, Abram's brother, was unwilling to go farther, so he remained at Haran and made his home at that place. After this Abram made a second start. Now he took only his wife, Sarai, his nephew Lot, and their servants. Driving their flocks and herds before them, they turned away from the great river and journeyed southwest, toward the land of Canaan. On one side of them the mountains rose wild and high, while on the other side, as far as they could see, the barren desert stretched away toward the south. On and on they traveled-across rivers, through valleys, over hills-each day farther from their homeland and nearer to the land which God had promised. We do not know how many days and weeks and months passed by before they came to the plain of Moreh, where God spoke again to Abram. "This is the land," God told him, "that I will give to you and to your children." And Abram built an altar there and worshiped God. Now, this land of promise was called Canaan, because the Canaanite people lived in it. These people had been there for a long time and had built some towns and cities. Abram did not live among the Canaanite people, but pitched his tents out on the hills or plains, wherever. he could find grass for his cattle and sheep to eat and water for them to drink. All the while his flocks and herds grew larger, until finally Abram became very rich. Then there came a famine in the land. The grass failed and the waters of the brooks dried up. Nowhere could Abram find pasture, go he moved away from Canaan into the country called Egypt. Here he saw the great River Nile, and possibly even the pyramids and the sphinx. But he did not remain long in Egypt, because God did not want him to dwell there. When the famine ended in Canaan, he returned again to that country.